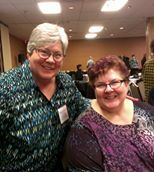 Me (left) with genealogy rockstar Cyndi Ingle (right). Here are some genealogy resources for you to get started with. It is by no means exhaustive! If you want exhaustive, check out Cyndi’s List below. Please let me know if you find something here that helps you!